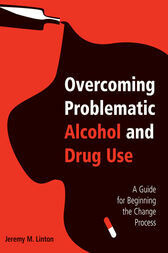 Overcoming Problematic Alcohol and Drug Use is a workbook for use with clients in treatment, informed by the most current research and literature in the substance abuse field. Offering a field-tested alternative to the disease model of addiction, the book introduces a six-session curriculum for treating persons with substance abuse issues and can be used as a self-help resource, or as a practice guide for human service professionals. Drawing on years of research on cognitive-behavioral therapy, the stages of change model, motivational interviewing, and solution-focused therapy, the author has put together a comprehensive and effective guide to change. "The book offers an organized, sensible, rational alternative to the more emotion-based model of AA. Clinicians will find it highly valuable to have an articulated program designed to move a client or patient through the relevant steps of a recovery process that does not involve spiritual or religious overtones, or a requirement that the person see himself or herself as helpless in the face of substance use. With a flexible application to a client based on education, substance abuse history, current substance use, and comorbid pathology, this program could be very productive." - Joan B. Read, PsycCritiques, Feb 2008 Vol. 53, Iss. 7. Jeremy M. Linton, PhD, is on the faculty of the Counseling and Human Services program at Indiana University South Bend and is a Consulting Mental Health Counselor at the Samaritan Counseling Center in South Bend, IN. He teaches courses on alcohol and drug abuse and conducts research in this area. He has also provided substance abuse counseling services in prisons and jails, residential treatment programs, community agencies, and private practice. He is a Licensed Mental Health Counselor and has advanced training in substance abuse and couples and family counseling. Dr. Linton regularly conducts trainings on substance abuse counseling and supervises students working in substance abuse counseling settings.